Brushing Your Teeth. We suggest twice a day at morning and night. When brushing our teeth, we should aim to be as gentle as possible, working in a circular motion targeting both the gums and the teeth. Flossing Daily. This important step in your oral health routine enables you to maintain the areas in between your teeth that are not accessible to the toothbrush. A gentle flossing technique will enable you to have healthy gums. If you notice bleeding, this may be a sign that there is inflammation of the gums and we recommend you contact us. Brushing Your Tongue. Doing so can help to remove plaque that can cause bad breath and promote the growth of bacteria. In addition to home care, we encourage you to visit us every six months for a checkup and professional cleaning. Your hygienist will begin by carefully scraping tartar from your teeth using a small metal tool. Next, the hygienist uses a lightly abrasive polishing compound to deep clean your teeth and remove surface stains. 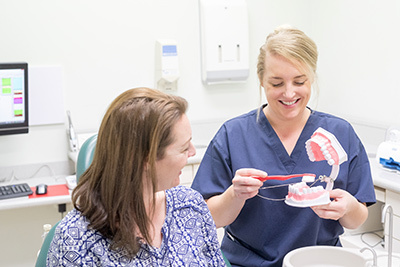 The hygienist will then floss your teeth to ensure that all plaque buildup has been removed. It’s an essential step in preventing tooth decay. Fluoride may then be provided to help further protect teeth from tooth decay. Routine cleanings only take about 30 minutes. If you experience any pain, bleeding or have broken teeth between checkups, please contact the practice straightaway. If you’re overdue for a checkup, we invite you to schedule one today at Willeri Dental in Parkwood!